I am officially a curmudgeon. 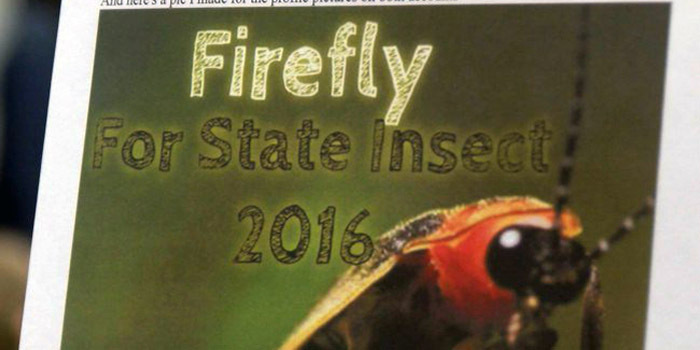 A week or so ago, I heard a story on the radio about a second grade class that was working to make the firefly Indiana’s state insect. The kids conducted a postcard campaign to their state senator and representatives to introduce a bill and put it up for vote. Great, you say. How better for the kids to learn about government, you say. While I can’t disagree with that logic, I can disagree with the entire premise. While those (incredibly resourceful, passionate, precocious) children are learning how our legislature operates, our legislators get bogged down with one more unnecessary measure. Aren’t we paying them to take care of things like schools and roads and safety and general welfare and oh, you know, important stuff? Look, I love kids and I’m all about making learning fun and meaningful. Really and truly. I want teachers to find as many ways as possible to engage their students. But not this one. I mean, look. Indiana legislators have enough to do as they try to fix the mess (they made) with standardized testing, the integrity of the office of the Superintendent of Public Instruction, and religious freedom. Bills routinely die on the vine because there’s not enough time in a legislative session to move them all through the process anyway. Basically, they’ve got a lot to do, so I’d like them to focus on the things that matter. Apparently, this isn’t the first time this issue has come up. A similar bill was introduced in the 1990s, but it failed to advance because one senator refused to hear it. One. In my book, he’s the only one who stood up and said, Hey! This isn’t what you’re paying me to do! Forty-nine other senators forgot that. How about this: the second grade teacher could organize a mock legislature and the kids could prepare, introduce, and debate the bill themselves. They could follow it through the process to understand what it takes not only for a bill to become law, but also how an issue even gets to the bill stage. Heck, they could even have their legislators come in and be part of the fun–once the General Assembly has adjourned, of course. Lawmaking not a quick or even a simple process (check out the rules HERE), but I’m pretty sure they’d learn a lot more about making things happen if they did it themselves–and they’d appreciate it a whole lot more, too. I don’t want to be mean. I just want to keep our government on track. Unless our lawmakers are trying to figure out how to pay for mosquito spraying to ward off West Nile virus or malaria or something, insects shouldn’t even be on their radar. Like I said, I’m a curmudgeon.